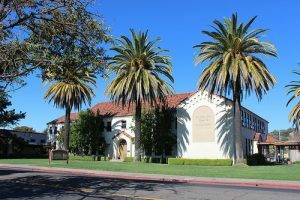 Founded in May 1966, the St. Francis Solano Thrift Program was established as the support group for the education programs of the parish. For many years the organization sponsored very successful semi-annual rummage sales. On July 13, 1976, the first Church Mouse Thrift shop was opened, fully planned, decorated, staffed and stocked by volunteers. On November 13, 1979, the second Church Mouse opened on the Sonoma Plaza. Finally, an all-under-one-roof workshop, donation and sales center was planned. This new store, the Thrift Center, a 6,000 square foot modular steel building, was erected in Aqua Caliente. It opened for business in 1984. 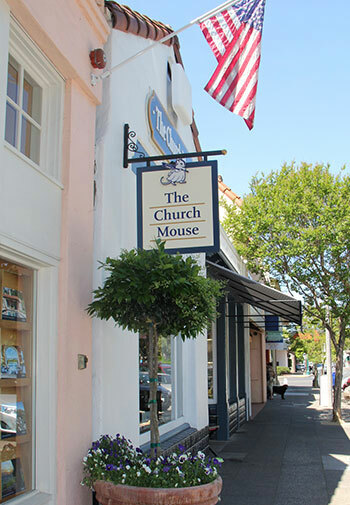 Combining the talents of parishioners, retirees, parents, grandparents, students & friends, the Church Mouse has grown into a thriving business dedicated to the support of more than 450 students in Sonoma Valley. Using its organization and facilities, the Church Mouse has become a distribution center and conduit for donations all over the region. A Sonoma Valley tradition since 1979, and located on Sonoma’s historic Plaza, this store is a hidden gem amidst fine & casual dining venues, wine tasting shops, clothing stores, real estate offices, and gift shops. This location carries an array of curated odds and ends and high-end clothing, shoes, accessories. 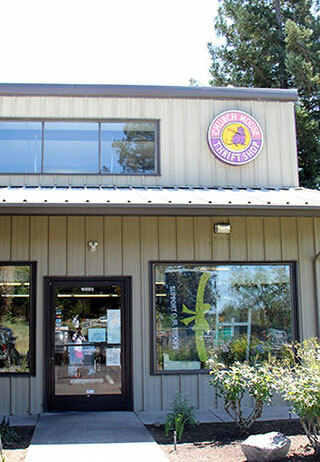 Please note, we do not accept donations at this location, but we take them Tuesday through Saturday at our Thrift Center location at 16885 Sonoma Highway. A thrift destination since it opened for business in 1984, this location is our donation and sorting, as well as sales location. This store carries a wide array of every item imaginable: furniture, clothing (baby, children, women & men), hardware, electronics, shoes, purses, holiday items, sporting goods, cookware & kitchenware, toys, crafts, books, frames, and anything else you can imagine. Bring your clothing, furniture, antiques, collectibles to our Thrift Center location Tuesday through Saturday during our normal business hours. Your donations are tax deductible! The Church Mouse is a 501(c)3 organization. We also will arrange a pick up! Items MUST be pre-screened and all large item donations are subject to space availability. Pickups are scheduled on Wednesdays or Thursdays, subject to driver availability. Call (707) 996-5115 to schedule or obtain more information. Pictures of your furniture can be emailed to churchmousesonoma@gmail.com. there are locations throughout the county that will take some items for free that are considered recyclable. Check the county website for more info. For people interested in assisting fire victims of the October 2017 Northbay fires, Facebook has a page dedicated to the fires and fire victims. It’s called Sonoma Valley Fire Updates 2017. It’s EXTREMELY active and posts can be made for items people would like to give to fire victims. 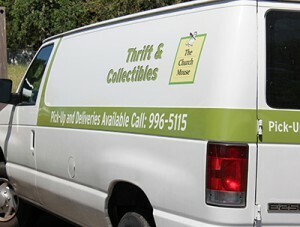 St. Francis Church Mouse Thrift Stores have volunteer opportunities at both of our stores. If you enjoy working with the public and have good customer services skills, we have the job for you. Job duties would include making sales, answering the telephone, tagging and pricing merchandise and stocking. We would schedule 3-4 hour shifts, once a week on the day that you are available. If you are interested in working with friendly, caring people and helping support St. Francis Solano School, please contact the Thrift Center at (707) 996-5115. The Church Mouse has provided a continuing, substantial subsidy to St. Francis Solano School for more than 30 years. St. Francis Solano School is the only Catholic school in the Diocese blessed to be subsidized by a thrift store. Family volunteer hours make the difference. Each St. Francis Solano school family commits to 2 hours of volunteer work per student, per month. Hours can be completed in any of the stores or by picking up work to take home. Grandparents, in-laws, aunts, uncles, and friends may help families achieve their hours. Each 8th Grade student is required to fulfill 15 hours at the Church Mouse. Service hours are volunteer hours – not paid. Students are encouraged to work at the stores in pairs or to schedule take home work. Each 8th grader is responsible to contact the Church Mouse location of his/her choice to schedule required hours. 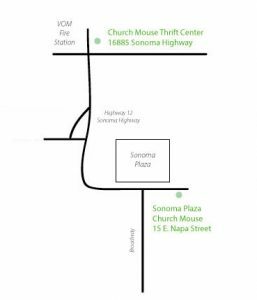 Visit us at either our north valley Thrift Center location at 16885 Sonoma Highway or at our downtown Plaza location at 15 East Napa Street.